The thing I might love most about nail polish is how versatile it is. You can take the same colors and apply them in different ways to get completely different manicures. 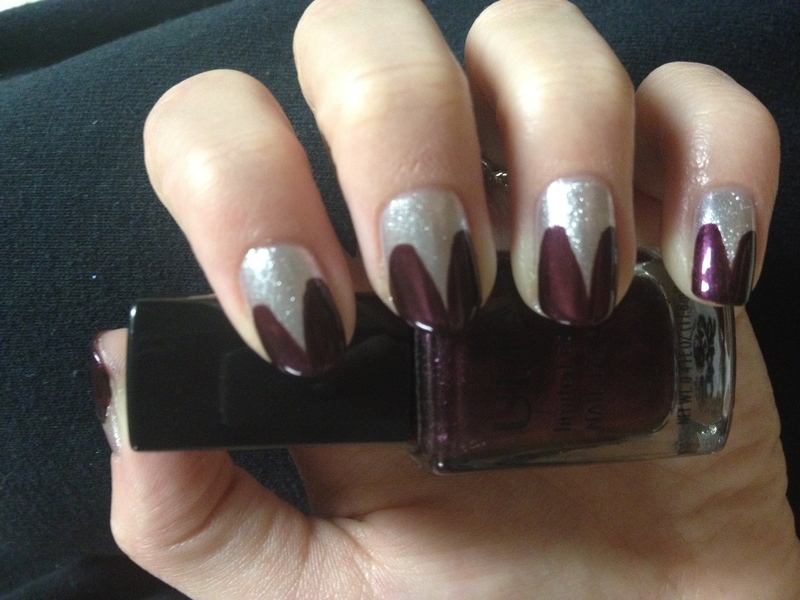 On the other hand, you could do the exact same design in different colors and get a different effect! For example, a classic French manicure is girly and pretty. If you do a French manicure with black and gold instead, you’ve got yourself a rocker chic look. If you give two people the same polish and tell them to do whatever they want, you’ll probably end up with two different manicures. What you do with your nails can represent you as a person, what style you want to rock, or even how you’re feeling on that particular day. Today, I want my nails to make a bold statement, without a lot of work. That’s exactly what I got with this Faux Claw manicure. Even my dad saw my nails and said, “Wow, how did you do that? !” For my dad to think my nails are cool, that probably means they’re pretty cool. Read on to see how I got this Faux Claw look. This manicure is deceiving. You don’t need any skinny brushes to make the claws. You don’t need to even have a steady hand, really. If you’ve painted your nails before, I’m pretty confident you’ll be able to do this mani on yourself. Start, as always, with a base coat. And, as always, I’m using Seche Natural. Funny story – I actually bought Seche Natural thinking it would be a matte top coat because it says “matte finish nail treatment” on the bottle. I got so mad when it wasn’t mattifying my nail polish, and then I read that it’s really a strengthening base coat. Now I love it. Back to the manicure. Start out with the color that you want to be your “claw.” I think that this should be the brighter, bolder color. Whether you want to use glitter or not, the key to this look is using a color that will stand out against your other color. 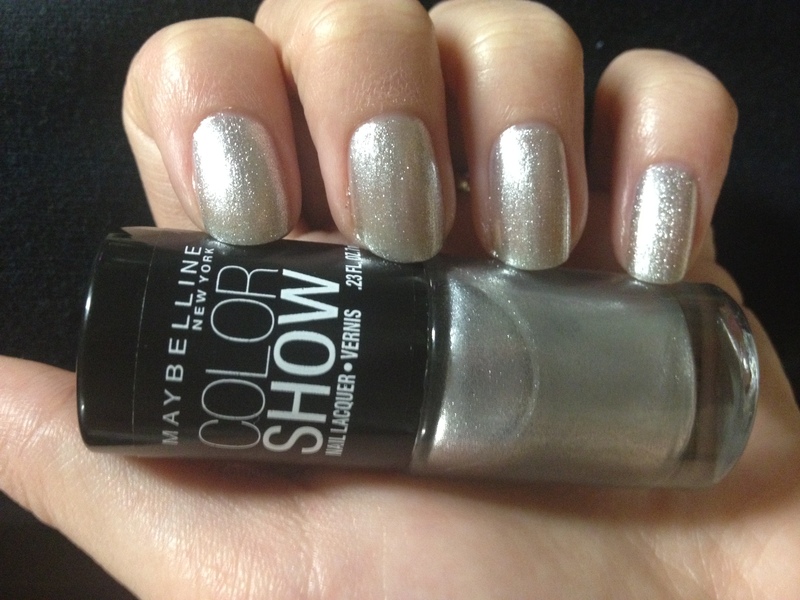 I used Maybelline’s Color Show Nail Lacquer in Pedal to the Metal, which is a trying-to-be-opaque silver glitter. I love it, really, but it’s not as opaque as I’d like, so I have to use three coats to get the look I want. For your second color, you want to choose a color that will make your faux claws pop. If you used a light color as a base, use a dark color for this step, and vice versa. 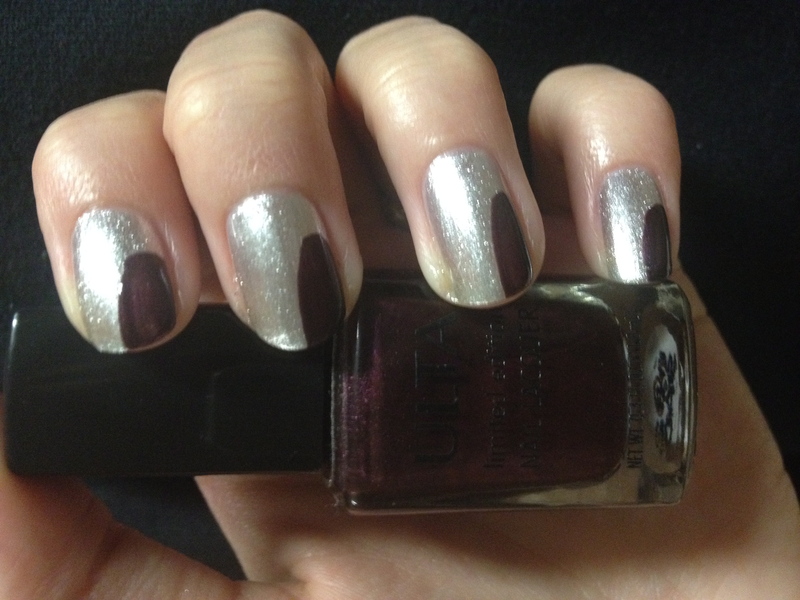 I used Ulta‘s Limited Edition Nail Lacquer in Femme Fatale, which is a dark burgundy. You’ll actually be using this color to create the claws. Start about a half inch away from your nail bed and apply the darker color straight down. I continued this step on each nail so you could see exactly what I did. If the top isn’t rounding off like in the photo, feel free to circle the brush around a bit to create a rounded shape. Depending on the shape of the brush, you may have to work the polish a bit. Although I didn’t use it for this manicure, Sally Hansen’s Complete Salon Manicure has the perfect brush for this because the brush itself is tapered to create a rounded shape. 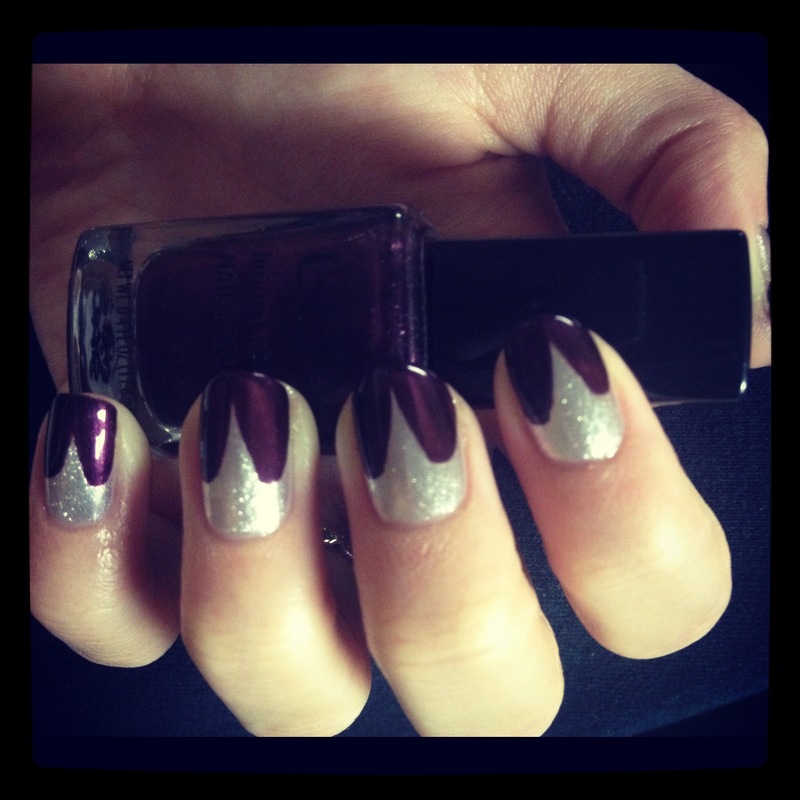 Finish the look by repeating the last step on the other side of your nail, and end with a top coat! My favorite is Seche Vite because it will seal your nails and dry your manicure quickly – no smudges! What colors would you use to get this faux claw look?